I have to thank Ina again. This recipe came from her new cookbook Back to Basics. 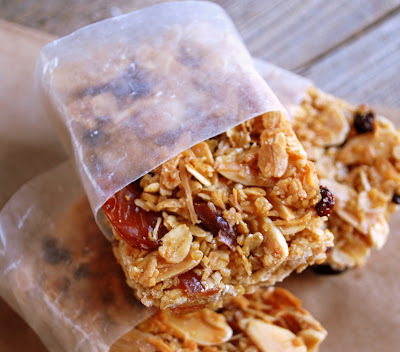 Granola bars and just plain ole granola in general, is one of my favorite breakfast foods. I usually make a few big triple batches of granola each each so I always have some on hand to stir into oatmeal and yogurt. I thought I'd whip up a batch of bars this time. 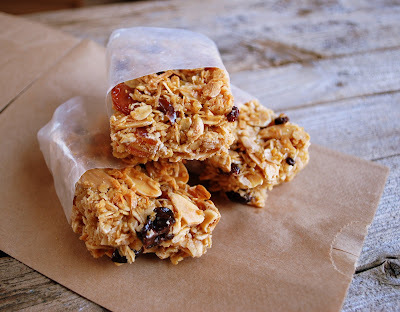 I substituted the 1/2 cups of dried apricots and cranberries in this recipe for mixed dried fruit which contained two kind of raisins, strawberries, cherries and apricots. A little bit of everything. I did use the dates as suggested. I love dates. You can certainly use any kind of dried fruit you like. Next time I might even throw in some extra coconut and add some dried pineapple. Portable and good for you too. Preheat the oven to 350. Grease an 8 x 12 inch baking pan. (Ok I have to comment on one thing here cause it drives me crazy.....why do all Ina's recipe call for 8x12 inch pan? All my pans are 9x13, some even clearly marked 9x13 on the bottom. Does she have some secret stash of pans that are an inch smaller then the rest of us?? I love ya Ina, but that drives me bonkers.) Ok now that we have that cleared up. Grease a 9x13 inch pan and line it with parchment paper. Toss the oatmeal, almonds and coconut together on a sheet pan and bake 10 - 12 minutes, stirring occasionally, until lightly browned. Mine took 14 minutes. Transfer the mixture to a large mixing bowl and stir in the wheat germ. Place the butter, honey, brown sugar, vanilla and salt in a small saucepan and bring to a boil over medium heat. Cook and stir for one minute, then pour over the toasted oatmeal mixture. Add the dried fruit and stir well. Pour the mixture into a the pan. Wet your fingers and lightly press into the pan. Bake for 25 - 30 minutes, until light golden brown. Cool for at least 2 to 3 hours before cutting into squares. Serve at room temperature. Stored in a covered container. I bought this book at Sam's today. Can't wait to crack it open and try some things out. Hey, Lisa, do you have a good cheese soup recipe? I've been looking for a recipe similar to one I had a few years back. It had (ugh) Cheez Wiz in it. I won't do that, but I'm thinking smoked gouda (which is actually a processed cheese) would be good. It had onion slivers in it and some heat as well. I made these this weekend as I had the same book and wanted to make something healthy for my family. Well they are delicious but very crumbly. Use a bowl to catch crumbs. And you MUST wait until they are totally cooled down before cutting. I think next time I may even throw them in the fridge for the last hour of cooling to harden up the honey more.